SEATTLE (Waste Advantage): Legislation proposed in the Illinois Senate would overhaul the state’s electronic waste recycling program, requiring electronics manufacturers to pay for permanent recycling drop-off sites set up by counties. Two amendments introduced Monday to Senate Bill 1417 would amend the state’s Electronic Products Recycling and Reuse Act, which established Illinois’ e-waste recycling program in 2009. The program marked a major achievement for environmental groups, and in its first years saw significant increases in the number of electronics recycled and jobs created by electronic collectors and recyclers, according to a memo from the Illinois Environmental Council. But changes to the electronics market over the past three years have exposed flaws in the program, which sets recycling goals for manufacturers based on the weight of electronics sold. Manufacturers that fail to meet their recycling goals must pay a penalty of 70 cents per pound for which they came up short. But because new products weigh less than older ones, annual weight goals – which are based on the weight of electronics sold in Illinois during the previous year – have decreased, giving manufacturers less of an incentive to encourage recycling. With the amendments to SB 1417, filed by State Sen. Pamela Althoff, R-McHenry, the e-waste program would transition from a weight-based standard to a “convenience standard,” according to the bill. Starting in 2019, the law would allow counties to establish permanent e-recycling drop-off locations. The maximum number of drop-off sites would be determined by a county’s density. For example, Cook County could open up to 25 sites. 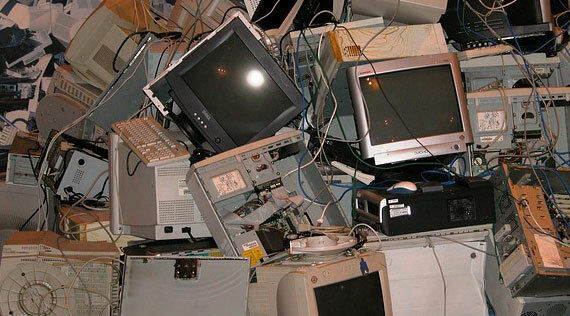 Electronics manufacturers would be required to pay for the recycling of any electronics collected at the drop-off sites. “The current system is broken and legislators have made a sincere effort to work with local governments, recyclers, collectors, manufacturers and environmentalists to try a new approach,” Walling said.